“Ladies and gentlemen, you all have one thing in common: you’re all being blackmailed.” Everyone who loves the film has their own memories of how they first came to see it. They probably read the opening line of this article in Tim Curry’s determined, but nonetheless prim, “working for someone wealthy” voice. Clue is most certainly one of the wittiest films I’ve ever seen, recalling the lightning fast dialogue deliveries of the Hawksian and Lubitschian screwball comedies of yore, but it works surprisingly well as a commentary on paranoia in the 1950s. For each of the color coded characters, they one by one reveal their motivations and, through them, reveal the turbulent social atmosphere almost as well as any film noir of the time. Sure, it may just be a red herring, but one worth murdering about. To create some impetus for the characters’ various motivations and to give each of their dark secrets texture, Lynn moved the story to New England in the mid-1950s, amidst the McCarthy hearings. Lynn says to Adam B. Vary, “I had to find a way to make sense of a situation in which there were a whole lot of people with obviously false names. I knew all about McCarthyism because I had friends much older than me who’d been involved in it. That was the period of American history that I knew most about.” Setting up the environment like this would thus have an impact on how the characters interacted with one another and what message the story would convey in the end. At the dinner table, all of the six members reveal where they work or who they work for, while still retaining the anonymity that their colors provide them with. It’s a slightly paradoxical aspect of the film: the audience manages to learn a fair amount the characters, including Wadsworth the Butler (the incomparable Tim Curry), and yet still not know who they truly are. All of them work in Washington, D.C., revealing their ties with the government. Each of the reasons why they are being blackmailed give even more insight into the social and political atmosphere of the film: Mr. Green (Michael McKean) works in the State Department and is a homosexual;, Mrs. Peacock (Eileen Brennan) has accepted bribes to ensure her Senator husband’s vote and win; Professor Plum (Christopher Lloyd) is a philandering psychiatrist who works with the World Health Organization, a subset of the United Nations; Mrs. White (Madeline Khan) is a black widow and whose previous husband worked as a nuclear physicist; Colonel Mustard (Martin Mull) works at the Pentagon and is accused of being a war profiteer; and Miss Scarlet (Lesley Ann Warren) operates an illegal brothel in Washington who has a cop on her payroll. Against the backdrop of McCarthyism, each reason for blackmail seems apt; not only does it inform the paranoid tendencies towards Communism, but it also divulges the homophobia, continued sexual repression of the era, and the friction of the developments of the Cold War. Wadsworth goes through each blackmail victim one by one, again, giving more texture to the background of the film. Even in this scene, it is discernable how thick the air is with tension. The politics of the time create an inherent rigidity in body language and ideas, one that the characters fight against constantly. The fight against this inflexible atmosphere is primarily for comedic reasons, but as the film, and its cast of players, becomes more manic, the fight to remain innocent and retain composure and the one to give up entirely converge. The characters’ reactions to one another’s dark secrets are just as interesting illustrated through audio as they are through imagery: gasps, looks of contempt, expressions of desire, the iconic line deliveries from each superb actor. After each character is interrogated (in Wadsworth’s way), they all have an immediate reaction, which exposes their feelings about the matter and, through the ideology of the time, how society as a whole would have responded. However, that the characters are so disgusted and contemptuous of one another makes them out to be hypocrites an excellent reflection not only of the Witch Hunt that the public play acted, but also of the McCarthy hearings themselves. The man in dark with the more than ironic name, Mr. Boddy (Lee Ving), is exposed early in the film as the man who’s been blackmailing the six party guests. And once Mr. Boddy gives the six of them the chance to walk away unharmed by killing Wadsworth, things go, of course, terribly. And yet, compared with the rest of the film, it’s fairly calm. Wadsworth makes a confession to the group: his wife committed suicide because they, too, were being blackmailed by Mr. Boddy. Why? His wife “had friends who were… [long, dramatic beat] socialists!” His audience gasps, again, audibly, shocked that anyone could be friends with a socialist. This conversation, though, speaks a great deal of how we perceive American ideals, as does the film as a whole. Wadsworth continues that Mr. Boddy thought the group “thoroughly un-American” and “decided to make a little money off of it. What could be more American than that?” This statement, in some ways, seems to distill the film’s ideas easily and critique the transformation of the American Dream: The United States has developed a strong sense of national identity, which has been characterized by certain actions and ideals, the two of which become intertwined. One of these ideas is, of course, the American Dream: the possibility of life, liberty, the pursuit of happiness, and, most importantly, money. In their own way, these wealthy players are all trying to live the American dream, but Mr. Boddy can do it better. By profiting from their secrets, Mr. Boddy is able to physically manifest the idea that a) those who are “going against” what the American Dream means (to him) should be punished and b) one should be on their way to the top in any way they can. Again, there’s a paradox here, once again showing the hypocrisy of the character. But that he resorts to blackmailing and not simply turning everyone into the police is indicative of power hunger, relating again to the American Dream. The film views fear in as farcical a lens as one could imagine, but it also employs horror film and detective mystery tropes, not so much subverting them, but utilizing them for its own agenda. Not one character really trusts the other, each suspecting the other that they’re the murderer and, worse, allowing what had been exposed before get in the way. Unlike many films where the trapped must work together in order to survive the night, everyone holds a certain amount animosity against the other. They are, later in the film as they set out to explore the old house, forced together, like two members of opposite political parties made, like children, to stay together. At heart, they pretty much detest one another. Most of the comedy of the film is derived from this dynamic, reminiscent, as aforementioned, of the fast talking screwball comedies of the 1930s. (Another gem from the BuzzFeed article: Before principal photography began, Lynn took his cast to a screening of Hawks’ His Girl Friday.) The horn dog Prof. Plum is paired with the anxious prude Mrs. Peacock; the timid homosexual Mr. Green gets paired with the buxom and sensual Yvette the Maid (Colleen Camp), etc. There’s a stark juxtaposition in how the characters are put together for the scenes. Their distrust of one another, though, reminds one of the conditioned citizens who were told to watch their back for Communists. One is even reminded of the simple, silly cartoons that propagated the Red Scare. The setting gets another flourish of establishment by the phone call from J. Edgar Hoover to Wadsworth, which is answered by the police officer. When asked why Wadsworth has the “Head of the Federal Bureau of Investigation” is on his phone, he replies, “He’s on everybody else’s, why shouldn’t he be on mine?” This amusing line, though, establishes the watchful eye of Big Brother at the time, always fearful of what Communist would reveal themselves next. The film’s treatment of sexuality harks back to screwball comedies in terms of how the humor is executed, but the characters’ treatment of it is more similar to the 1950s. Such sexual repression is manifested by the closeted Mr. Green, a man who cannot come out for fear he will lose his job. Contextually, homosexuality not only would have been frowned upon, but almost equally worthy of blacklisting (such arbitrary connections were made at the time), and, while the reaction shots nevertheless get a big laugh, the awkward and contemptuous looks from everyone else seems painfully accurate. Mrs. Peacock’s disapproving look, in particular, is scathing. What of the other characters? Col. Mustard’s trip to various brothels, while frowned upon by some of the women, is justified by Prof. Plum when he says that every soldier has “visited a house of ill fame”, but, in general, no one seems to raise that much of an eyebrow. They are curious when Wadsworth tells everyone that Mr. Boddy has negatives of the Colonel in flagrante delicto, but it’s seemed as almost natural. Prof. Plum’s own sexual misgivings are looked upon with more concern, as Wadsworth explains that it is the primary reason his psychiatric license was revoked. Miss Scarlet, a woman of deep wit and sardonicism, is a figure of power, the personification of a woman who embraces her sexuality and uses it to her advantage. She and Mrs. White, are a pair of deadly femme fatales, essentially, but both of their sexual escapades are the reasons why they’re being blackmailed. It seemingly reinforces the stereotypes of the time, perpetuating the deadliness of a woman who can explore and be given agency through her sexuality. Most compelling of all these secrets and mishaps is how they all are connected to the Cold War. As we have established, the film is set in 1954 amidst the McCarthy Hearings. Much of the character ideologies, actions, and reactions are all based on some idea of what it is to be American and the idea of paranoia. It works as a critique of the era, a time where trust didn’t truly exist and when someone could easily name you during a hearing and make your life a living Hell. The characters’ backgrounds are all also related to politics. It’s the final, show stopping act where everything is revealed. Although it was a financial disaster when it was released in 1985, partially because of its three endings, it’s the endings that are most indicative of social and political commentary. In the first ending, Miss Scarlet is exposed as the murderer, and with whom Yvette was working in cahoots. Turns out that while she may run a brother, her “real business is secrets”. She is as despicable as Mr. Boddy, using information to gain the advantage: Senator Peacock’s defense committee, Col. Mustard’s fusion bomb, and Mrs. White’s nuclear physicist husband, all of it information she sold. Mr. Green exclaims, “So it is political! You’re a Communist!” She replies smartly and smarmily, “No, Mr. Green, Communism is just a Red Herring. Like all members of the Oldest Profession, I’m a Capitalist.” It’s interesting that these labels should be used, but more fascinating how revelatory they are with respect to how these scenes work contextually. Arthur Miller’s seminal play The Crucible further examines the arbitrary fear and indictment during the Red Scare, but Clue presents the idea in a different, but equally sinister manner. It is not a secret that the McCarthy Hearings were in and of themselves scare tactics, but, while Clue doesn’t try to be an allegory, it presents a character who uses fear to here capitalistic advantage. Miss Scarlet, already an unscrupulous character, is as opportunistic in her employment of blackmail as McCarthy was in his use of propaganda and fear. When Miss Scarlet is arrested, the Chief Inspector makes a callback to an earlier moment in the film, where he appeared as a door to door evangelist warning the guests that Armageddon was upon them and that their lives were in danger. At the moment of arrest, the Chief Inspector quips, “I warn you, my dear, Mr. Hoover is an expert on Armageddon.” Painful irony can be derived from this line, as Hoover had his watchful eye on everyone at the time, and could have been easily compared to God in terms of his power and ability to create his own Armageddon for people. In the second ending, Mrs. Peacock is the culprit, but like in the previous ending, “Communism is just a Red Herring.” The meaning of this line changes slightly in this ending, since the motive for the murders is merely so Mrs. Peacock can protect herself. But her easy access to the world of politics nonetheless reinforced the Cold War themes: her husband has influence over defense contracts and was being bribed by foreign powers. It seems that the line is used merely to get Peacock out of the room, since it is very plausible that the foreign power bribing her could be a Communistic foreign power. The woman who is previously seen as anxious and quirky transforms to someone dourer. This line is one of the most famous from the film, but what does it say about political ideology as a whole? The interconnected ideas and beliefs that come together as ideology are sometimes used and abused for the power holder’s own means, where it is as a scare tactic, for information, or for greed. The McCarthy Hearings weren’t the only time an ideology was used to create fear in the public eye: history is riddled with such cases. Therefore, it’s surprising how incisive the commentary is in what amounts to a wacky, silly movie. Jonathan Lynn, though, is able to balance the two expertly, making a truly hysterical film while sharply criticizing McCarthyism and the Red Scare. But, aside from the political subtext and commentary of the film, it is, first and foremost, one of the funniest movies ever made. Thankfully, after it flopped at the box office, it has risen to cult status. And, like the era it recreates, it’s a film all about secrets and lies. When all is said and done though, we must not forget, it’s not just a game anymore. 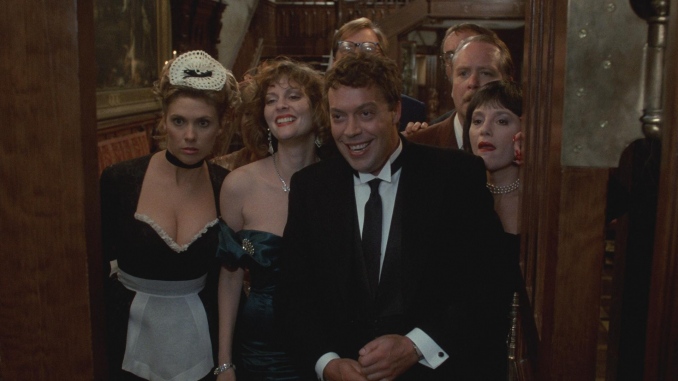 I took a look at one of my favorite films ever, CLUE, and its political subtext. I’ve been waiting to write this for years!